A few Friday nights ago, we had the pleasure of testing out yet another fine local pizza establishment. In our crosshairs this time was Lighthouse Pizza located in a small strip mall just north of Pacific street at 74th. Their large, clean restaurant has plenty of seating, a number of flat screen televisions, a help yourself soda fountain, some of the coldest beer in Omaha and, wait for it, a drive-thru for those who just can’t muster up the strength to park and walk across the parking lot. Oh and one more important bit that clearly caters to the college crowd at nearby UNO, they’re open until 3am on Friday and Saturday nights. The menu for the night was a slice each of: BBQ Chicken (Roast Chicken, Bacon, Onions, BBQ Sauce), Mac and Cheese (Roast Chicken, Bacon, Macaroni, Alfredo Sauce), Thai Chicken (Roast Chicken, Carrots, Onions, Sweet Chili Sauce, Thai Peanut Sauce), and Vegetarian Pesto (Green Peppers, Onions, Mushrooms, Spinach, Basil Pesto Sauce). Oh and let’s not forget, a few very cold beers. One additional note about the beers, they were only a buck. Not a buck plus tax. A buck all in. Nice! I don’t know if that’s an all day thing or just for happy hour, but it was a pleasant surprise. Regardless, The Pizza Wife nearly wept with joy. All of the slices were quickly prepared and delivered to our table on their own silver disk. Silverware (it’s plastic) is available next to the soda fountain and guaranteed to break upon first use. UPDATE: The people have spoken and LH has listened! Silverware is real metal now! Lighthouse uses an infrared conveyor pizza oven, which is different than other conveyor ovens that use jets of hot air to bake the pie. They use fancy lasers or something in their oven that produces an extremely crispity, crunchity crust unlike anything we’ve tried before. 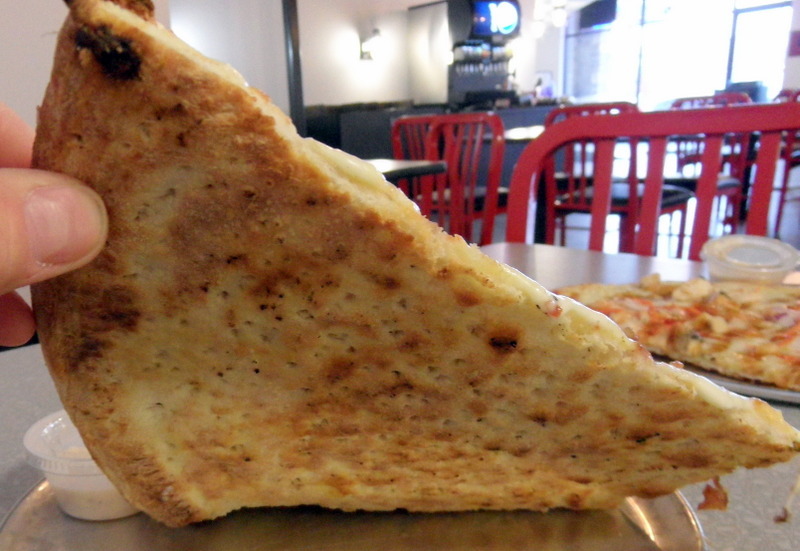 The crust is a bit thicker than other New York stylish pizzas, and certainly stiffer which is good because of the size of the slices. The bad part in our opinion is that the crusts were a bit dry and definitely not chewy. 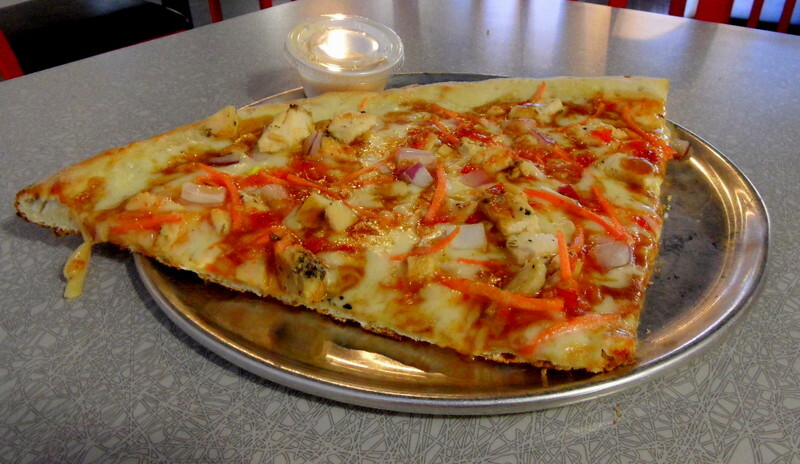 We’ll start here with our clear winner of the four pies we had: the Thai Chicken Pizza. It had the perfect amount of heat and great overall flavor. The combination of the roast chicken, carrots, onions, sweet chili sauce, and Thai peanut sauce was excpetional. 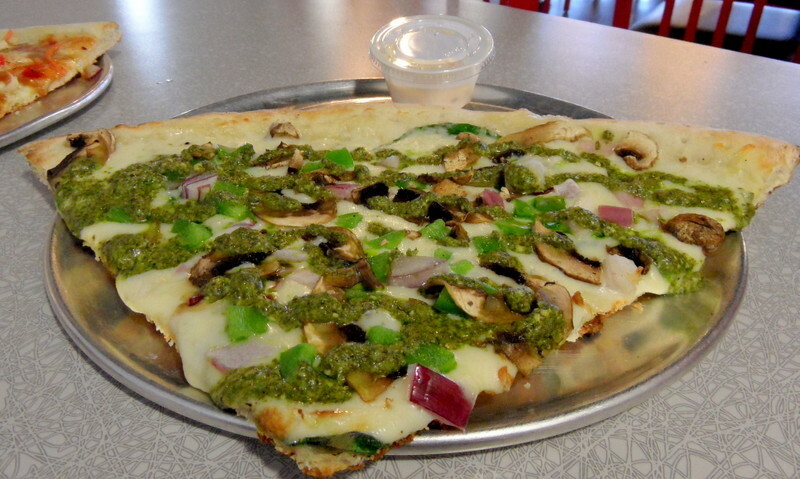 We felt the Vegetarian Pesto Pizza’s pesto had a bit too much garlic to it, which unfortunately overpowered the rest of the ingredients. You couldn’t really taste the basil. On the plus side, the pesto sauce was not runny from too much oil like other places we’ve tried it. Another critique from The Pizza Wife was that there weren’t near enough veggies. The lady loves her veggies and would have liked to see more. 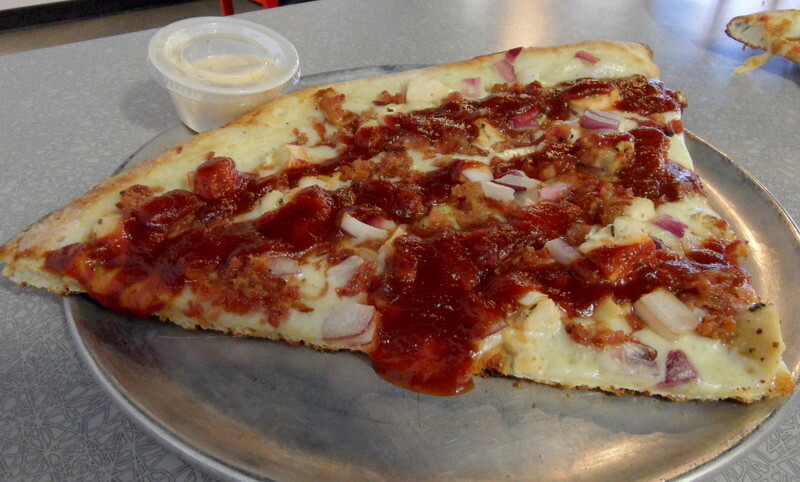 The BBQ Chicken Pizza was good, and it was my second favorite pie. It did, however, have quite a bit of sweet BBQ sauce on it, which again kinda overpowered the rest of the ingredients. I’ve found that less is more when it comes to BBQ pizzas. A little goes a long way. Still, having said that, it was good. I had high hopes for the Mac and Cheese Pizza, but we both came away from this one a little disappointed. We found the Alfredo sauce too bland. Of the three pies we had, this is the only one I wouldn’t go back for seconds of. 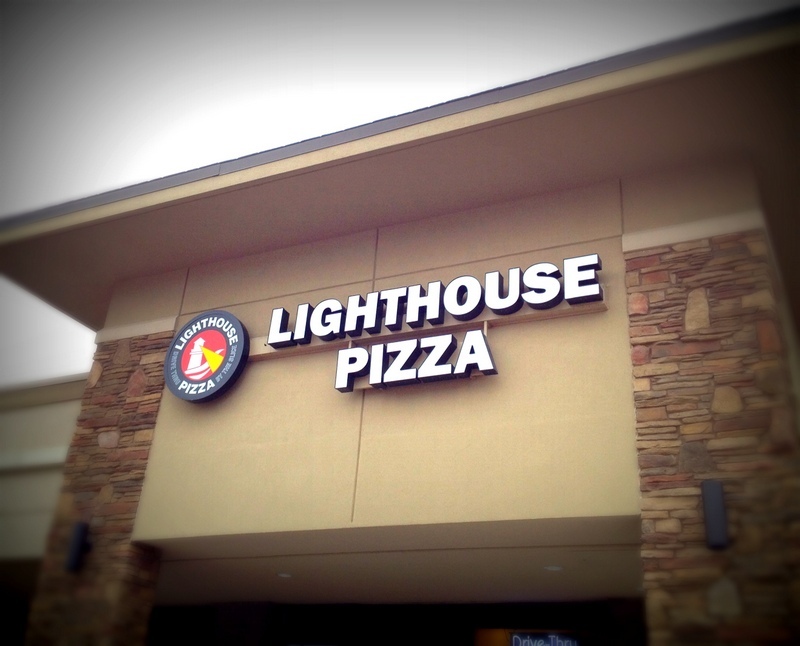 Overall we were impressed with the whole Lighthouse Pizza vibe. The place had plenty of seating, it was clean, the people working there were helpful, they have a great selection of specialty pizzas on their menu, and their crispy pizzas were good as well. If we’re ever out cruising around the Aksarben area at 2am on a Friday or Saturday night, we’d certainly hit ’em up again and we suggest you do the same. The bad: Some ingredients were a bit overpowering. 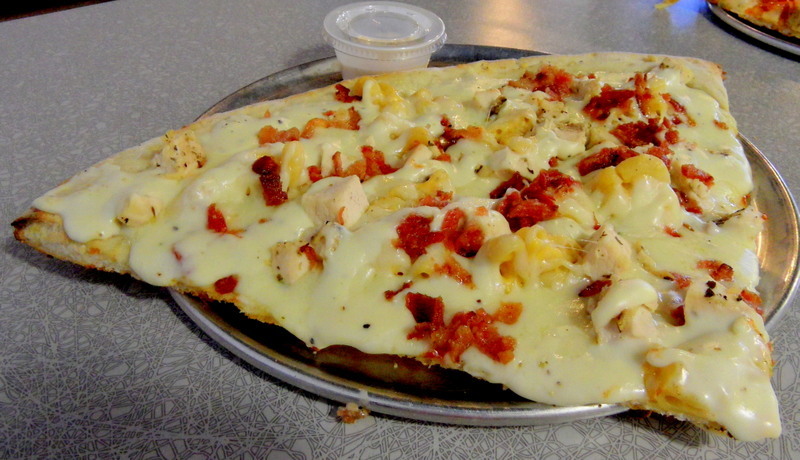 How would you rate Lighthouse Pizza? Click on the stars below! This entry was posted in Pizza and tagged Lighthouse Pizza. Bookmark the permalink.